One of my all time favorite summer flavor combinations is tomato & basil! There is nothing quite like a garden fresh, homegrown tomato and gorgeous, fresh basil leaves - add some fresh mozzarella and you have an amazing salad! We have had the nicest basil I have ever seen through our CSA and we have been thoroughly enjoying it. 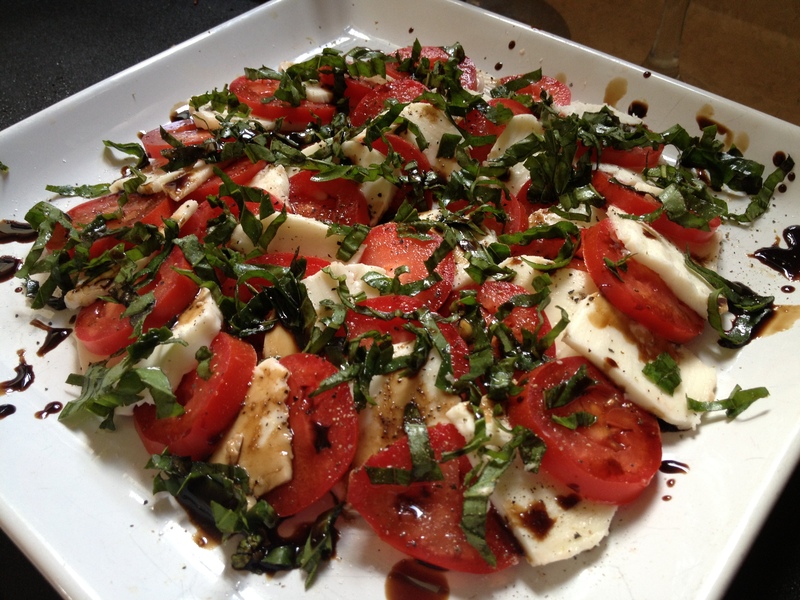 I generally make my caprese salad fairly structured on a plate but you can make it however you like! The amount of ingredients are completely up to you - I used 4 small tomatoes and 3-4 ounces of cheese with about 12 large basil leaves on the salad below. You can serve this with some sliced and toasted Italian bread rubbed with fresh garlic for a nod to bruschetta. Totally delicious! Thinly slice the tomato(es) and fresh mozzarella. Chiffonade the basil (to do this: stack the leaves on top of each other and roll them together from the long side to the other long side and then thinly slice). Arrange the tomato and cheese in an alternating pattern on a plate. Sprinkle with the basil chiffonade. Freshly grind Salt & Pepper to taste. Drizzle with a good quality Balsamic Vinegar (I have some general use vinegar and then I have some amazing vinegar that I reserve for uses such as this). Let stand at room temperature for 20-30 minutes to allow flavors to mingle. Enjoy! Yum! This looks delicious! My basil plant is booming so I will def. have to try this! Thanks!